ONE New England recently learned that Narragansett was given permission by the government to brew porter for “Medicinal Purposes” during prohibition. This along with selling ice and soda helped the brewery make it through that era. Now with the release of our porter for the winter, they ran this great piece on the beer and it’s history. Here’s the full story from ONENewEngland.com. It’s not often that a single beer can be responsible for saving a company during hard times, but Narragansett’s winter craft beer, Porter, has that distinction. According to Mark Hellendrung, President and CEO, Porter kept the company afloat during Prohibition. As Hellendrung relates, Porter was like the medical marijuana of its day because it was found to have medicinal uses. It contained iron, important to pregnant woman, and was made available to them (and likely their spouses) via a prescription. Available now through February, Porter, a Silver medal winner at the World Beer Championships in 2010, is ale that is seven percent alcohol and a blend of seven different malts including chocolate and roasted malt. Available in 16oz Tallboy cans and on draught at bars and restaurants throughout New England, Porter this year makes its debut in Southern New York, North Carolina, and Florida. Committed to New England and bringing back Narragansett to its prominence as a uniquely New England brand, Hellendrung is readying plans to reopen a major brewery at a yet undisclosed place in Rhode Island. Narragansett Winter Craft Porter is currently brewed under the supervision of award-winning Brew master Sean Larkin at Trinity Brew House in Providence, RI, Cottrell Brewery in Pawcatuck, CT, and High Falls Brewery in Rochester, NY. 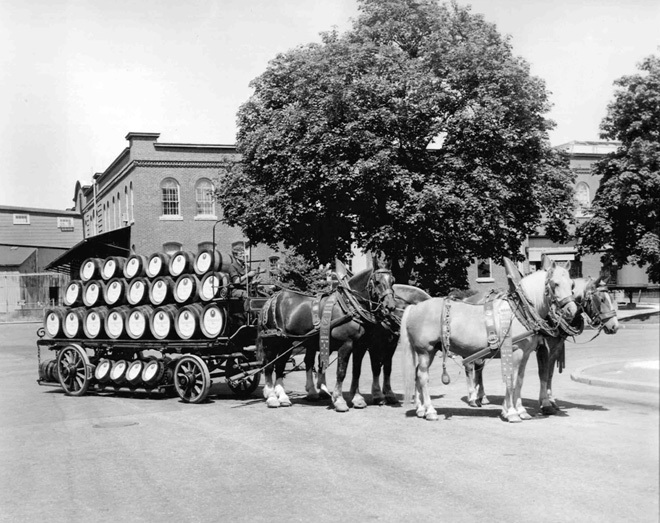 Narragansett Beer is one of the oldest brewers in New England. Founded in 1888, by the “original six”, one of whom was Jacob Wirth – a name familiar to Bostonians for the famous restaurant on Stuart Street. Most New England beer drinkers are familiar with the company’s icon, the famous “Chief Gansett”, but it’s doubtful that many realize that this famous icon was designed by another famous icon, Theodore Geisel, known to millions as Dr. Seuss. With the launching of the now famous line, “Hi Neighbor, have a Gansett” and the signing of the voice of the Boston Red Sox’s, Curt Gowdy, as company spokesperson, Narragansett Beer became the best selling beer by the mid-fifties. After being purchased by the Falstaff Brewing Company in 1965, the company and its aged Cranston, Rhode Island brewery began to see their dominance of the New England market erode. By 1981, increased competition and the cost of maintenance of its turn of the century main brewing facility in Cranston was more than the company could maintain. The company’s Cranston plant was closed and the equipment was shipped to China in 1995. In early 2005, lifelong Rhode Islander Mark Hellendrung, along with a group of New England investors, purchased the rights to Narragansett Beer from Falstaff. Former Brew master Bill Anderson was brought on board to ensure the authenticity of the brew. That October, for the first time in a quarter century, Narragansett Beer was back in bottles and on bar taps. For further information on Narragansett Winter Craft Porter, or to find a retailer near you, visit: http://www.narragansettbeer.com.